"Man proposes, heaven disposes." Most of us rush to give advice and make grandiose plans. The Wiseman reminds us that wisdom comes from submitting to instruction for a significant period of time and then, only at the end of long listening does it come. If you are like me, you would do much better to let your plans ripen a bit more in the light of the Lord before you launch into them. I am comforted that James, the wisdom writer of the New Testament, reminds us that God will give that wisdom if we seek it and not doubt. 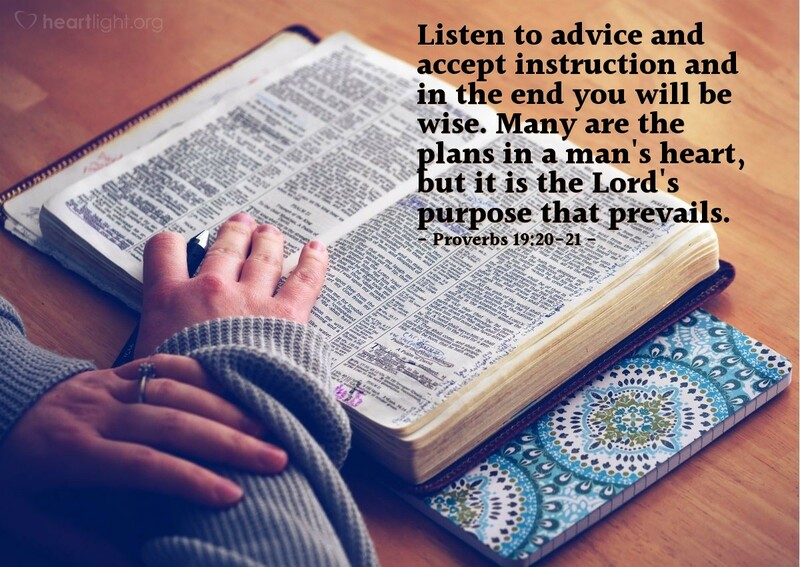 But while we pray for wisdom, let's pray also for patience to listen to the Lord's truth in Scripture so we may recognize wisdom when it comes! Almighty God, teach me your ways and help me discern your paths for my life. I have so many plans and schemes, but I know if they are not from you, they will not stand. Lead me to your wisdom and I will not only seek to know it but also seek to live it by the power supplied by your Holy Spirit. In Jesus' name, I pray. Amen.